Pork tenderloin recipes are some of my absolute favorites and this simple Hawaiian pork with pineapple is dynamite. Very easy and quick to make, it really packs a flavor punch. Just make sure you marinate the pork in the refrigerator for a few hours ahead to allow the flavors to permeate the meat. 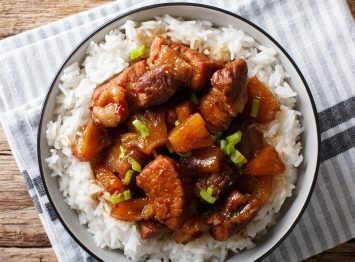 Marinate pork in teriyaki sauce for several hours in refrigerator. Add pineapple juice to a saucepan and bring to a boil. Add rice and cook for about 15 minutes or until rice is tender and liquid is absorbed. In a large skillet, over medium high heat, stir fry pork in hot oil for about 5 minutes or until browned. Add onion and peppers. Stir fry for 5 minutes. Stir in pineapple chunks and almonds. Heat through. A plastic zip lock bag is perfect for marinating meat. It allows the meat to “swim” in the marinade as long as it needs without dirtying a dish. Anything that save washing dishes is great with me! Please Note: If you absolutely need this recipe to be completely gluten free, please make sure that your teriyaki sauce is gluten free. If everyone is out of the house during the day, this is still a quick and easy dinner recipe. Just mix the marinade with the pork in the morning and quickly put together your meal in the evening. This Hawaiian pork goes well with rice and a vegetable stir fry on the side. Or mix lots of veggies into the rice. Look here for more delicious pork tenderloin recipes.